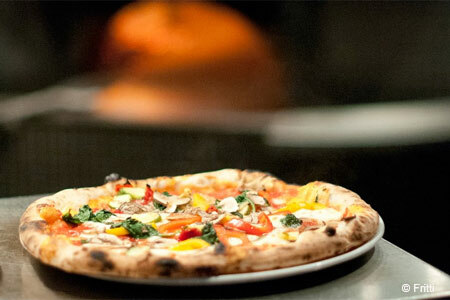 Quality ingredients and authentic preparation elevate the pizze and more. : Fritti offers an extensive pizza menu at lunch and dinner, and although the pies are indeed the defining dish, other options merit attention, too: crispy fried eggplant croquettes to be dipped in the tangy house-made marinara sauce; arancini and fried calamari with lemon --- enjoy these small plates with a glass of wine (try the Cantele Rosato di Negroamaro, a dry rosé, with any of the pizze). Creative panini are made with pizza dough for the midday meal (we like the vegetarian version but add slices of salumi to spice it up). A salad and any of several spiedini are available as well. Pizzas don't arrive sliced; however, staff will assist at the table if requested. Pies include pancetta and cipolla (caramelized onion), and the Toscana with buffalo milk mozzarella, salame, cherry tomatoes and rosemary (you may also have your pizza made with locally produced mozzarella from Orobianco). For dessert, get the panna cotta, chocolate soup or a Nutella pizza. The rigorously all-Italian wine list --- there is one Champagne --- is a delight.